The renaissance of the food community has birthed a whole new "rock star". From badass chef, Bourdain, to the tattoo-swathed Top Chef contestants, culinary culture has its own, underground phenomenon. Indie music and chic cuisine have finally established a conscious integration. M. Ward and Jim James, of Monsters of Folk, have started their own foodie blog called The Crèm-bru-log. The folkie foodies have decided to create a blog in order to determine the world's greatest crème bru1lée. The custard and caramel dessert mispronounced at tables worldwide will now be rated by the by the co-creators and readers will be given the opportunity to contribute their critiques. The rock and roll community once saw a comparable delve into the food world with Ted Nugent's machine-gun hunting techniques. The indie population has taken an appropriate, lighter approach. Flambé away! 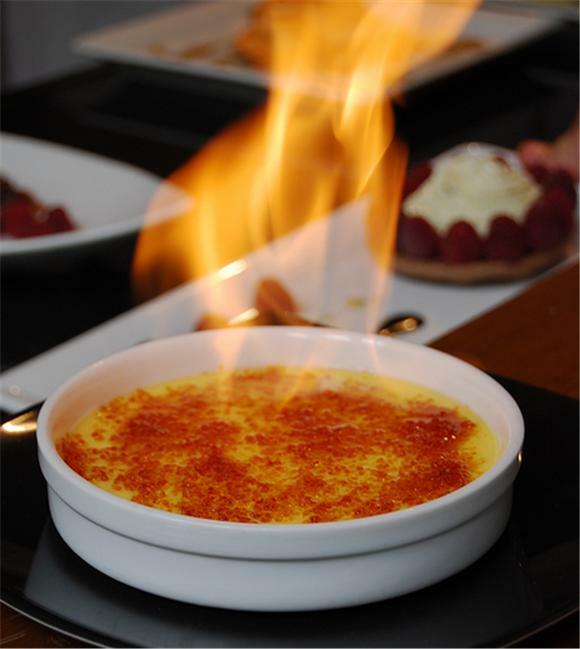 -each brulee reviewed will recieve a certain amount of logs. think of these logs as stars, points, or thumbs in other reviews you may read. for instance- joe so and so gave this new film 4 stars. there is no finite number to the ammount of logs that can be given, with infinite logs being the highest rating possible. 1.lets say m. ward reviews a brulee and gives it 135700655789 logs. then lets say some reader disagrees and decides they want to subtract 27638490 logs from ms review. the log score would then be 135673017299. but if the reader agreed with ms review they could add logs as well, thus making it a higher overall log score.